This updated version of a classic Joe Weider full-body workout will enhance size, strength, and conditioning and promote better recovery. Old-school training recently got a “new school” modification when I took my Countdown to Strength Challenge winners Jacqueline and Robert through a seemingly outdated workout. But "old" doesn’t mean "ineffective," at least not in this case. A lot of people (including myself) do their formal training during the week, with weekends reserved for other activities. Consider this workout more of a Saturday or Sunday active recovery session, but trust me, it’s thorough and intense enough to burn tons of calories, build muscle, and be considered a legitimate workout. It’s no walk in the park. 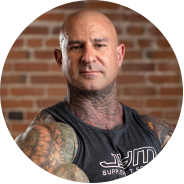 For the workout, I went back to my bodybuilding and fitness roots – we’re talking about some of my earliest experiences as a kid working out. I took one of the very first Joe Weider publications I ever had and, as we used to do back in the days of paper magazines, tore a page out and did the workout. The original Joe Weider plan is a full-body, beginner-level program. Even though it’s really good as originally written, I updated it a bit to share with the challenge winners as well as all my other followers and JimStoppani.com members. Professionally, I consider myself an educator and teacher above of all else, and I always strive to teach people new ways to train. In this case, the new way to train is actually based off a very old workout from The Master Blaster himself. The thing to remember is this: Just because something's old doesn’t mean it’s no longer effective; and just because something’s new doesn’t necessarily mean it’s better. Many of Joe Weider’s principles and training practices have stood the test of time, this workout included. Granted, I’m putting my own spin on it, but without Joe first paving the way many decades ago, I wouldn’t be here. The original routine by Joe Weider, which you could order and have mailed to you (I’m dating myself here, but I love the nostalgia of it! ), was a barbell course consisting of three weekly workouts – i.e., Monday, Wednesday, Friday. Like I said above, this was the beginner portion of the program. What I did was combine the three days into one workout so that it’s no longer a beginner routine. And whereas you might normally perform 3 or 4 sets per exercise if you were doing each workout on a separate day, with my version you’re doing only one set per exercise. Each of the three original workouts here is its own circuit, labeled Round 1, Round 2, and Round 3 in the below workout tables. Each round has its own chart, but it's all one workout – do Round 1, then Round 2, and finish with Round 3. Between rounds, rest as needed, anywhere from 1 to 3 minutes. Since it may take you some time to get set up for the first exercise in the next round, that setup time may be all the rest you need. As I mention in the above video, there are a number of different ways you can do these workouts. You don’t have to do the exercises in the exact order I list them. If you want to do all exercises for a muscle group across the three rounds before moving on to the next muscle group, go ahead and do that. For example, you can do all the chest exercises in Round 1, followed by all chest moves in Round 2 and Round 3, and then do the same thing for back, and so on to the other muscle groups. The way I wrote it up has you doing all exercises in Round 1, going from one exercise to the next with as little rest as possible (basically no rest), then moving onto Round 2, then Round 3. 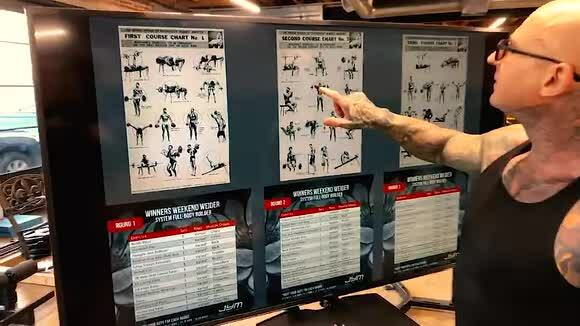 As you can see from the above image, the exercise selection in the older Joe Weider program is a bit different than what you'd normally see today – after all, that program is probably 40+ years old now. But it's not that much different than you'd expect. Most of those exercises are still used today by trainers, athletes, and strength coaches. And notice that the barbell hack squat (one of my favorite lower body exercises) is included in the "No. 2" workout. It just goes to show that Joe Weider was way ahead of his time in creating effective training programs to build size and strength and develop a great physique. He was a true pioneer! My version of the workout hits all 10 major muscle groups (chest, back, shoulders, legs, triceps, biceps, forearms, traps, abs, calves), as do all of my Train With Jim programs, but not quite with the same balance as I normally prescribe. For example, there are eight sets total of shoulders, yet only 2-5 sets each for all other muscle groups. But that's okay, as this is a singular workout, not a full program. How much weight to use and how many reps to perform for each exercise can vary. In the charts below, underneath the workouts, I listed five different rep ranges: 3-5, 6-8, 9-11, 12-15, and 16-20. These are all possible rep ranges you can use. The amount of weight to use would correspond to the rep range: the lower the reps, the heavier the weight, and vice versa. Select a weight that has you reaching muscle failure within the given rep range. These are just a few examples of how to mix up your rep ranges over the course of the workout. You don’t have to be this structured if you don’t want to. But personally, I like treating each round a bit differently in terms of reps and weight to subject the muscles to strength, hypertrophy, and conditioning protocols.